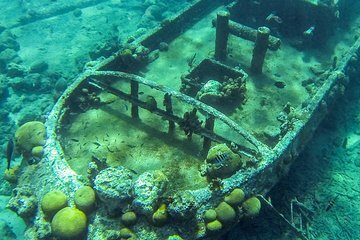 Erleben Sie auf einer 4-stündigen Schiffswrack-, Korallenriff- und Geschichtstour die tollsten Highlights von Curacao und gleiten Sie an zwei Schnorchelstellen der Insel ins Wasser. Beobachten Sie im Korallenriff Schwärme farbenfroher Fische, umrunden Sie einen alten versunkenen Schlepper, der mit Korallenformationen, Christmas-Tree-Würmern und Seegras überwuchert ist und beobachten Sie die Muränen und Meeresschildkröten, die an der geschützten Küste der Insel leben. Besuchen Sie eine zweite Schnorchelstelle, an der Sie über ein weiteres blühendes Riff hinweg schwimmen, um anschließend ein jahrhundertealtes Fort zu besichtigen, das zum Schutz der Küste vor Piratenüberfällen errichtet wurde. Der Schnorchelausflug war sehr gelungen. Die Guides geben sich auch mit Anfängern viel Mühe. Das Wasser war an beiden Schnorchelspots sehr klar. Best Snorkel Tour ever with our Tour Guide. He made it extra special. He watched our belongings while we went snorkeling. Thank you! Howard was terrific as our guide and the snorkeling sites were great. Loved seeing all the fish at the tugboat. Beatrice was a great guide she was informative, fun, on schedule. Bernice was the best, she took amazing photos with our camera. She saw things under the water and quickly pointed them out. This was the best tour of our entire cruise. Tug boat snorkel which was amazing. He made sure we were taken care of and everything was to our liking. We had the privilege of having Bernice as our tour guide, she was EXCELLENT!! Bernice picked us up at the cruise port and started right in with the history and culture of Curacao and a city tour. We went to two locations to snorkel, the first location was a local's beach where we snorkeled near the rocks, saw all kinds of beautiful fish and we were in very calm waters. The second location was the Tugboat location, again Bernice was very attentive to the four of us. It is a MUST DO if you ever have the opportunity to go to Curacao make sure you ask for Bernice she is wonderful. P.S. bring water shoes, the best spots to snorkel are at the rocky beaches. Elmer is fabulous and extremely knowledgeable. The wind was high and we couldn't get out to the second tugboat site because the water was too choppy. I would suggest if you haven't snorkeled before to use water shoes or simply not wear the fins. It was a great day and lots of fun! This was one of the best snorkeling trips I have been on. It was excellent and we could not have asked for a better guide in Bernice and a great driver in Elmer. They took us to some amazing snorkeling sites on the island of Curacao. This tour was well worth the money. I would definitely do this tour again and I would return to Curacao. I was very happy to see that Viator provides quality tour experiences.